Monday morning, I picked the last of the curly endive and mache from the bed that had held these hardy greens all winter. That same afternoon, I forked up the soil, raked in a little compost and set out starts of lettuce, radicchio, fennel, broccoli and cauliflower I’d seeded indoors a month ago. The day was sunny, the air was soft; spring had definitely edged out winter and it was wonderful to be kneeling next to a bed, hands in the dirt, planting. 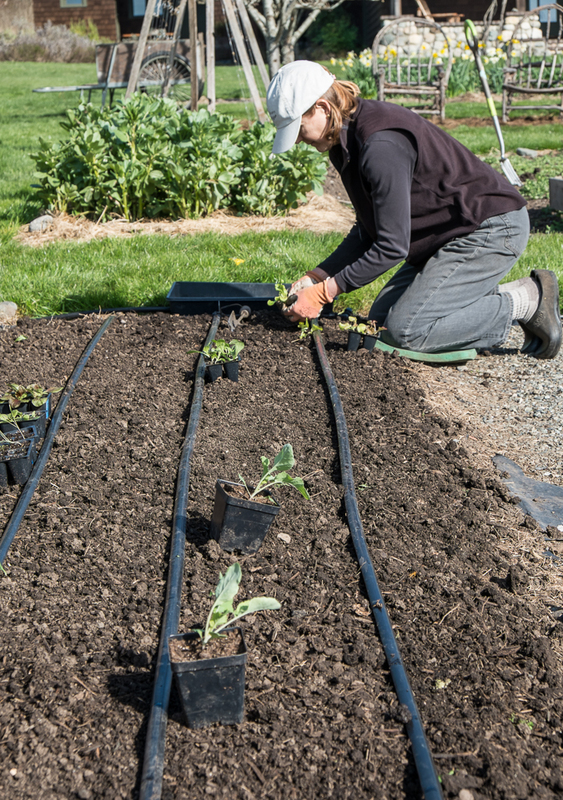 Harvesting the last of winter crops in the morning and planting spring crops in the afternoon is one of the pleasures of kitchen gardening this time of year. It will be weeks before these little starts will be the size of the greens I harvested that day, but it’s the cycle of planting and growing beginning again that gives pleasure. Noticing winter crops giving way to spring seeding and growth happens a lot this time of year. I pulled the last of the celery roots the other day, big, gnarly, thick-skinned but still sweet globes, and in a day or two I’ll plant a flat of tiny seeds for next year’s crop. There are a few big potatoes still to eat but there’s also a tray of small potatoes greening up for planting soon. The jar of dried tomatoes is nearly empty but sturdy new tomato plants are ready for the greenhouse. There’s one bag of storage onions left but the fragile green threads of next year’s onions are already growing, and though there’s only one more garlic bulb in the bin the green shafts of the new crop are growing taller each day. These are the reassuring patterns that delight kitchen gardeners as spring begins. The other day, a friend of mine described these early spring weeks as the hungry season. She was nearing the end of her storage vegetables, potatoes, squash and onions. She’d used most of them and those left were starting to grow sprouts or show rotten spots. Mine are the same. And in my kitchen garden the new growth on the hardy greens has begun but is not abundant yet. What sort of meal do these hungry season vegetables suggest? Pizza! Really! These vegetables would make delicious frittatas or tart fillings, pasta sauces or side dishes but friends were coming over and we wanted to make pizza. 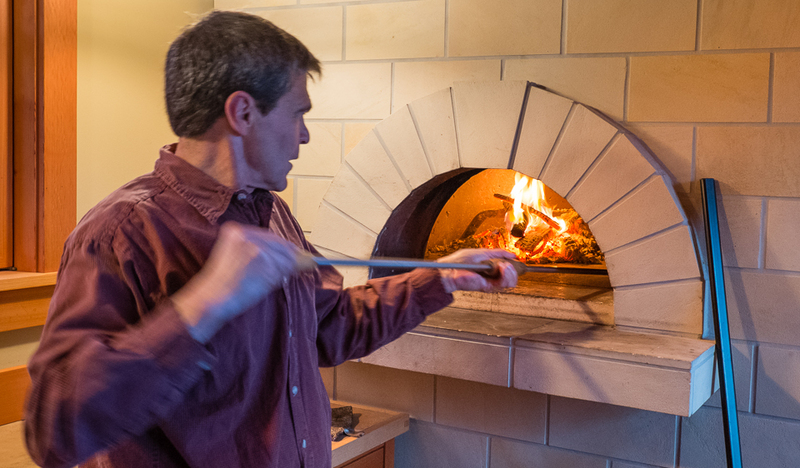 We have a wood fired oven and make a lot of pizza year round. Summer pizzas with fresh sliced tomatoes, grilled eggplant, roasted peppers or some combination of these three are classic. But this time of year the last potatoes and squash, sliced and roasted, and kale tops and leaves make fabulous pizza toppings. No tomato sauce needed. A good crust, a little flavorful cheese and really any topping will make pizza, even toppings from the hungry season. 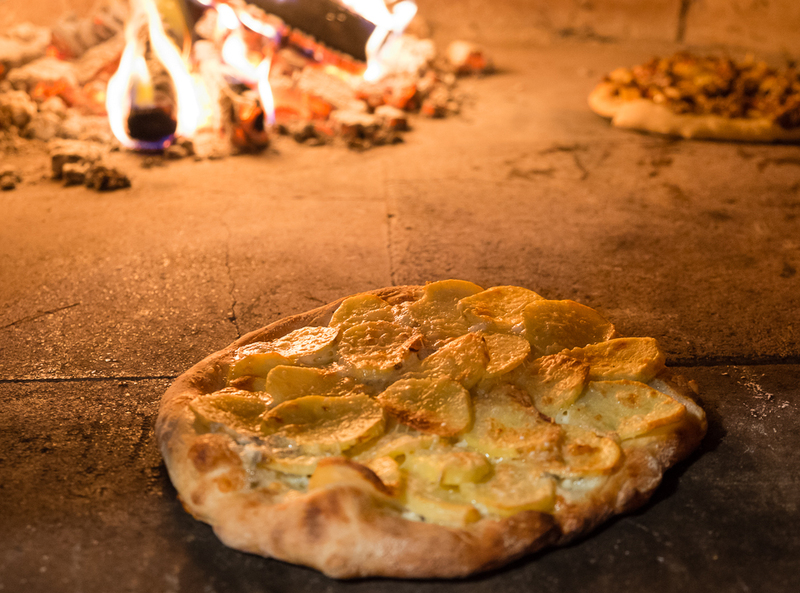 I make a medium crust pizza that cooks quickly on the 650-degree wood-fired oven floor. The simple dough of flour, yeast, salt and water, rounded after mixing into individual balls, rises slowly over about five hours, each ball becoming soft and pliable and stretching easily into a 10-inch pizza round that still shows the air bubbles of the dough. Because the dough is on the lighter side, these pizza crusts can’t support a lot of weight. About a third of a cup of cheese is plenty. I sprinkle the cheese on the dough before adding the toppings. The cheese helps glue the toppings to the dough and the toppings protect the cheese from toughening and burning. A final dusting of grated Parmesan adds a toasted cheese flavor. 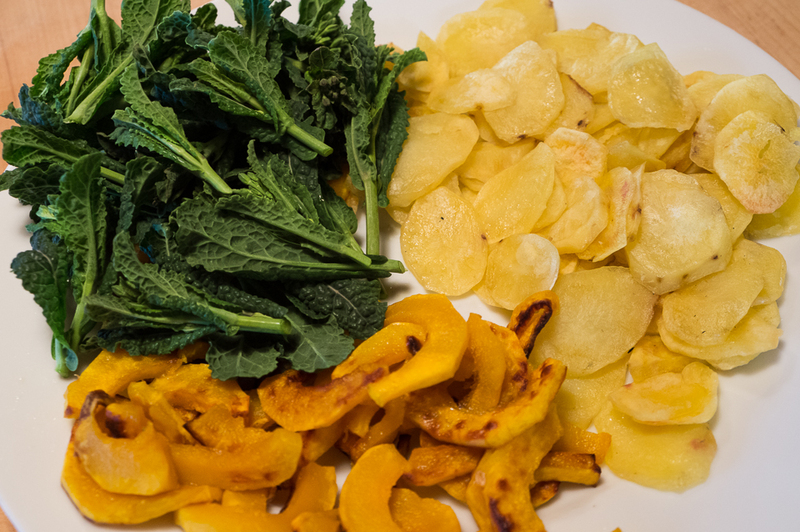 On two recent pizza nights, the toppings were roasted slices of Delicata Squash, roasted slices of potatoes, both Rose Finn Apple and Yellow Finn, and raw Lacinato kale flower buds. 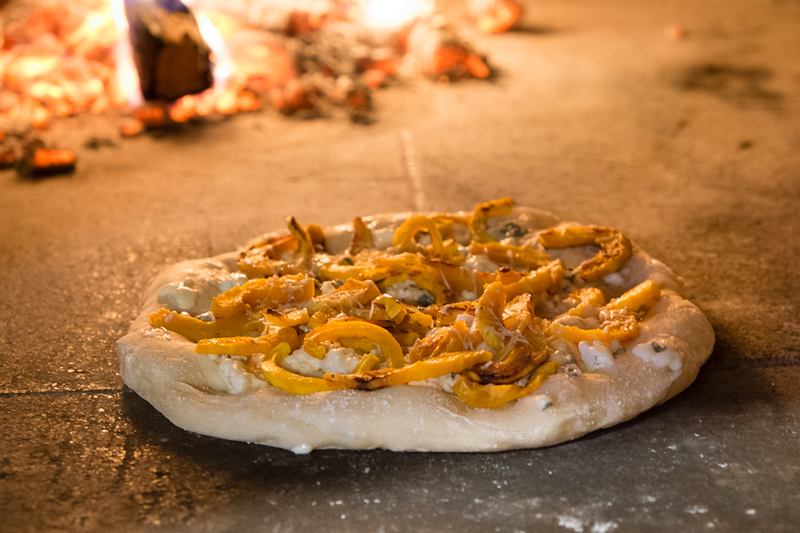 With the squash and potato pizzas, we used crumbled Gorgonzola cheese and a final dusting of grated Parmesan cheese, great flavor combinations of sweet squash, nutty potatos and pungent, slightly salty Gorgonzola. For the raw kale topping, we used grated Trugole cheese, a mildly tangy semi-soft cow’s milk cheese from Italy that melts well. I rubbed the kale flower buds with a little olive oil just before arranging them on the grated cheese and dusting them with Parmesan. 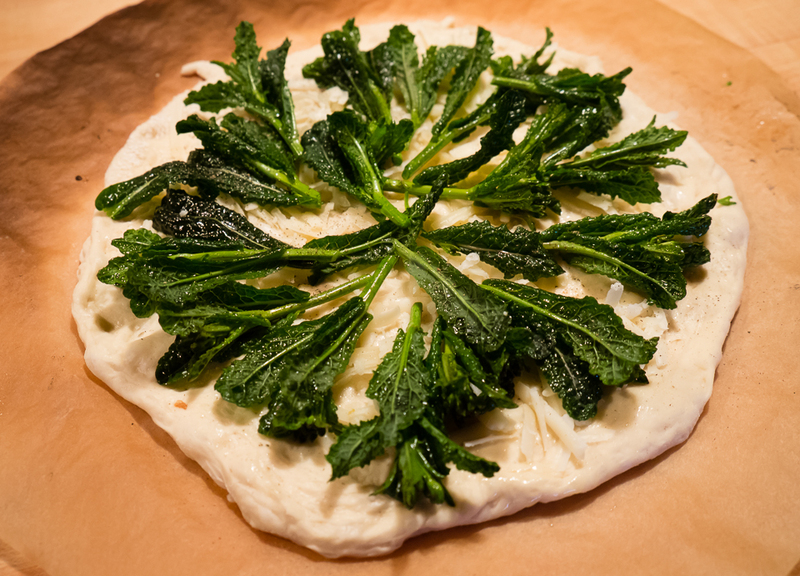 In the heat of the oven, the kale buds softened then crisped quickly. 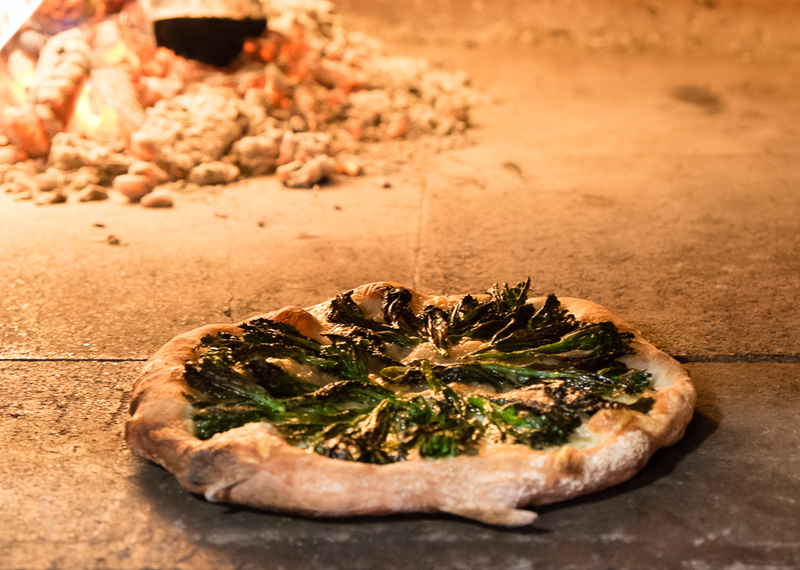 Beautiful to look at and amazingly tasty in its combination of crispy kale, melted cheese and chewy crust, this pizza was my favorite but all three were delicious and a perfect way to make the best of the hungry season. 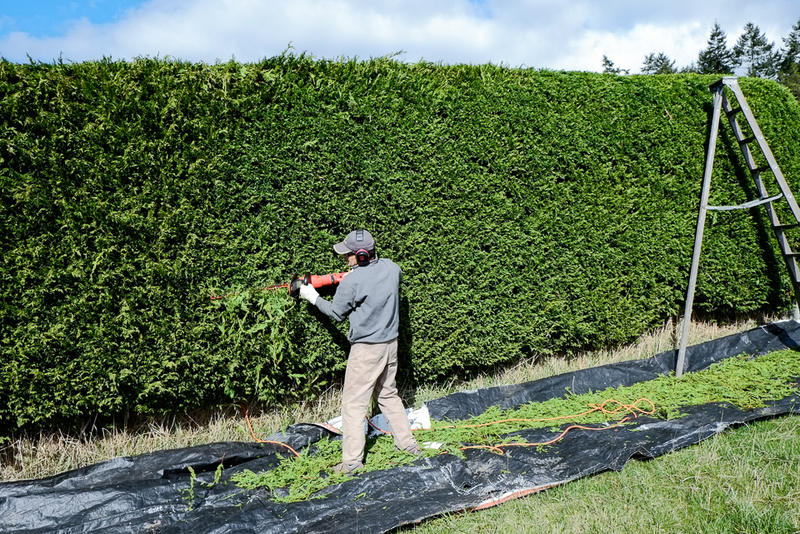 One of the distinguishing features of our kitchen garden is the eleven-foot tall Leyland Cypress hedge that surrounds it on three sides. We planted the hedge in 1994 as a windbreak for the new 120 by 110 foot garden, setting out gallon pot sized trees four feet on center. 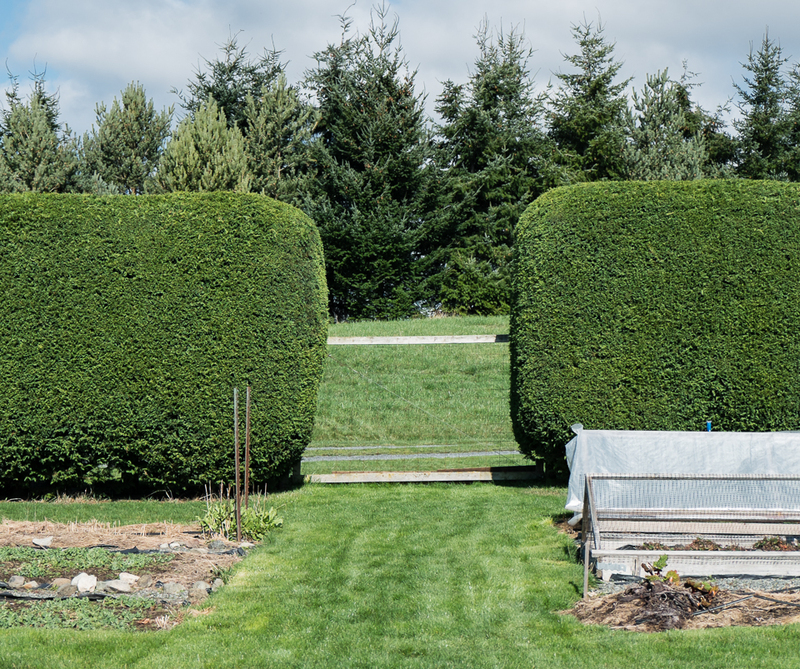 In its nearly twenty years, the hedge has tempered the prevailing winds, as we’d hoped, but it has also grown to define the garden space, setting it apart from the surrounding fields and enclosing fruit trees and vegetable beds in a green-walled room. It’s created a wonderfully private, protected space. But of course there is a catch. Leyland cypress grows vigorously up and out; there’s a forest lurking in this hedge. To tame it, we trim it once a year. 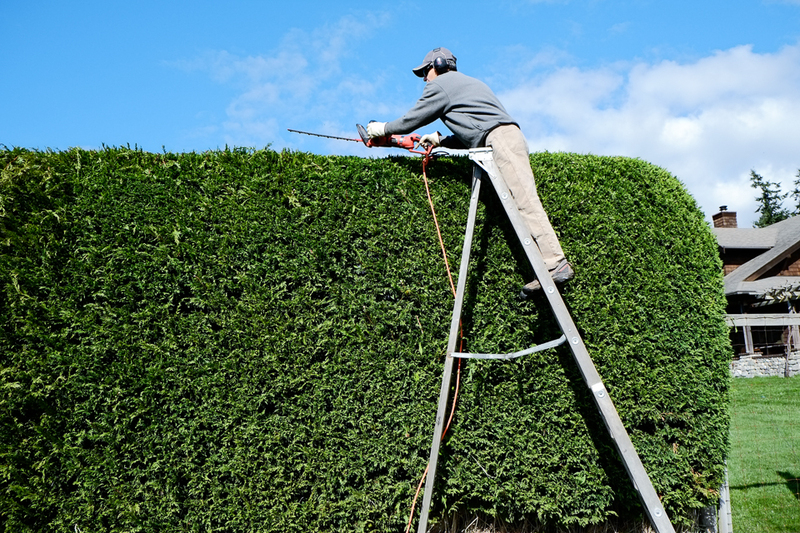 About this time every spring Scott tunes up his electric trimmer, a Black & Decker 24” hedge trimmer, strings out power cords and brings in a ladder for reaching the top of the hedge. As he shears along the inside walls and up onto the top, I spread out tarps to collect the trimmings as they fall then load them in a cart and move them to a compost pile. When the inside and top are done we move to the outside walls, repeating the shearing and the trimming collection. Once we get started, what seems like a big chore isn’t so bad, and in three or four afternoons we’re done. Sunny days with no wind are the most pleasant for this task. Cloudy days with breezes are more common. In either weather, it’s a great excuse to be outside early in the season, transforming the kitchen garden’s shaggy winter walls into velvety green spring surfaces.